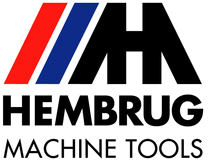 Hembrug will present the renewed Mikroturn® Twin Spindle – a dual spindle hard turning machine – at AMB 2014. The Mikroturn® Twin Spindle is a dual spindle version of the Mikroturn® series of hard turning machines and is designed to increase production output in the ultra-precision final processing of hardened steel workpieces with diameters of up to 100 mm. In particular, parts manufactured in large quantities, with cycle times of between 10 and 30 seconds. Hembrug engineers have succeeded in simplifying the design without having to compromise on functionality and precision. Existing modules of the Mikroturn 100 have been used as much as possible influencing the cost price and production time positively.The hydrostatic main spindles with integrated motors are positioned closer together. This has improved access to the processing space. 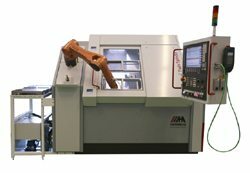 In addition, both spindles are now loaded directly by a KUKA robot without the addition of a further pivoting system, as was the case in the first generation of the Mikroturn® Twin Spindle. The linear motors in the guide tracks have been replaced by high-precision ball screws. The Mikroturn® Twin Spindle enables productivity increases of up to 100%. The dual spindle design enables a work piece to be processed on spindle 1 while automatic loading and unloading takes place on spindle 2. The integrated spindle motors reach a high torque (0-6,000 rpm in 0.6 sec) and are much more compact than their predecessors. Productivity can be increased by up to 100% for the same cycle and recharging times! With the Mikroturn® turning machines from Hembrug, the hard turning can in many cases be three times faster than comparable grinding processes. The Mikroturn® Twin Spindle goes one step further and enables additional improvements in cycle times and productivity.